Let’s start Monday off with my first in a series of holiday gift guides. This weekend I was eyeing bright colors with a homey twist. I having been craving things that feel more old-fashioned and English lately. Have fun looking! 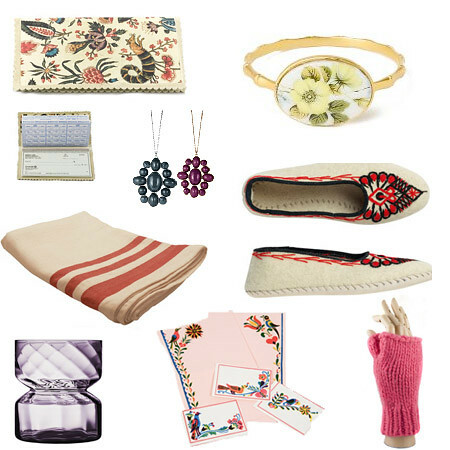 Clockwise from the top left: Ingrid Cusson checkbook cover $39, David Aubrey “Horticulture” Bangle $48, Monika Slipper about $75, New Scotland Fingerless Mittens $76, Pennsylvania Dutch Letter Sheets & Labels $12, Large Bulb Vase $28.95, Country Tablecloth $45, Going For Baroque Pendant $15. Terra Cotta Terrarium, $98, farmhousewares.com. Lovely slippers and bracelet. So happy to have discovered your blog!! You must must MUST check out the peacock earrings on my gift guide – they're a match made in heaven for this selection!